You can use mirethMusic to make a clip from a track. You can then use the clip as a ringtone on your iPhone or Android phone. Instructions are below. From the mirethMusic screen, click the “Clip” tab. Navigate to the track you want to make a clip for and click on it. 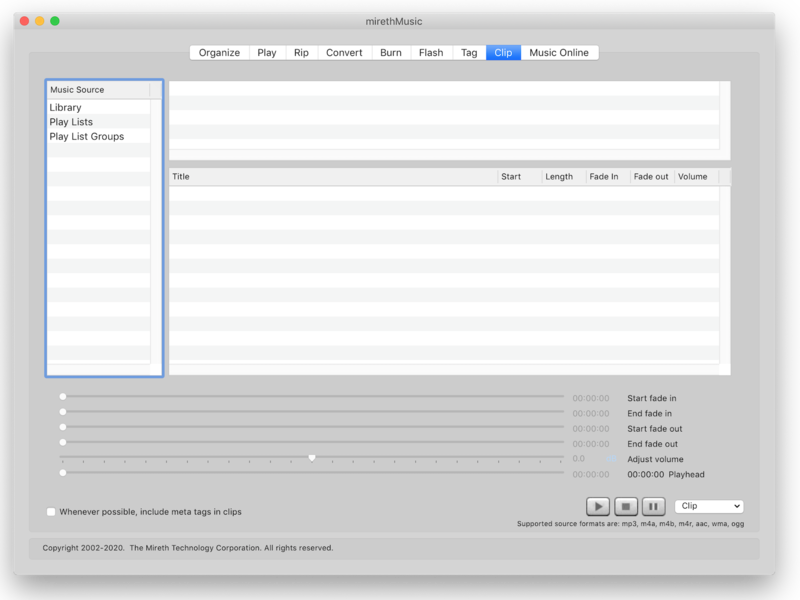 In the Music Source list, click on the music source type. In the Selected Source pane click, shift-click, or apple-click to select the items. In the Track List pane click, shift-click, or apple-click to select the tracks. Using the fields to the right of the track title or using the sliders below the track, modify the clip parameters, making sure the total duration of the clip is 30 second or less. Click the play button [>] to test the clip. If required, use the sliders below to adjust the parameters. Click the [Clip] menu and choose the format to convert the clip to. Once you have made the M4R file, you can drag it into the Ringtone section of iTunes and it will be synchronized with your iPhone. Once you have made the M4R file, drag it into the Ringtone section of iTunes and it will be synchronized with your iPhone. Once you have made the clip file, move the clip file to Device Storage on your Android phone. Select your ringtone from Device Storage.